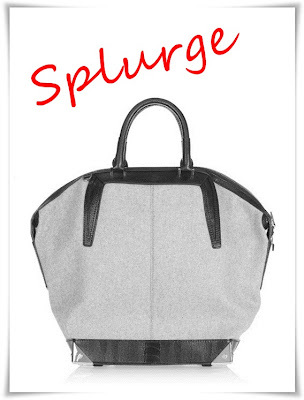 Babblings of a Mommy: Splurge vs. 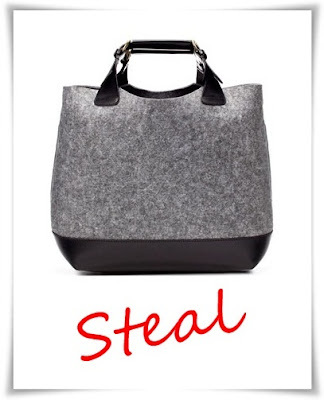 Steal: Alexander Wang Emile Tote. Splurge vs. Steal: Alexander Wang Emile Tote. How perfect is this Alexander Wang wool tote with leather inserts and handles for winter? Love it! For a more wallet-friendly version I found this Felt Shopper bag from Zara that definitely fits the bill. Both these bags are fly! I think I would actually want the Zara bag but top handles just don't work for me out and about with baby! The Alexander Wang one actually comes with a shoulder strap. But I'm actually the opposite! My daughter tends to tug or grab onto my bag so it's easier to have a top handle so that they shoulder strap doesn't keep falling. I love that Zara shopper. It comes in leather and other colors too. Jill, I saw it in a tan leather and it was simply gorgeous! I love it too.